Cross-merchandising is a great way to boost sales and provide convenience for your customers. Some examples are having a corkscrew bottle opener display strip in the wine aisle, a birthday candle display strip in the baking aisle, or a meat thermometer display strip in the meat section. Display strips also provide a means in which to display products when there is limited shelf space. We know the benefits of display strips and are proud to offer our customers many different options. Use these strips to hang merchandise that is usually hung on a hook. 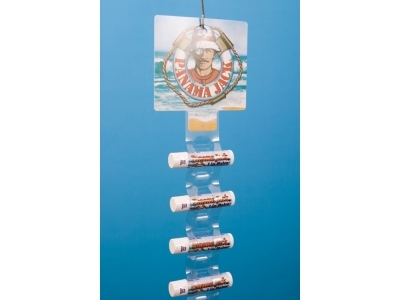 The plastic tabs go through the hole on the package and hang your product securely. These strips are custom made to best fit your product and specific display needs. These can include strips that hold bulky or oddly-shaped products, adhesive strips, bottle neck strips, horizontal strips, or printed display strips. Adhesive strips are best used with a more lightweight product. These strips give you the option to hang merchandise whose packaging isn’t necessarily intended to be hung. Brand identity is extremely important when selling a product. These strips will help customers locate you if you already have a known brand identity, or they will help you increase your brand identity if you are not as well known. Like the display strip headers, these strips will help build brand identity. The entire strip as well as the header is customized to showcase and compliment your brand and product packaging. We are an approved Walmart vendor for their “Impulse Strip Program.” We know the rules and requirements regarding display strips for Walmart stores. At Do-It Corporation, we know the value of cross-merchandising and brand identity. It’s not simply getting a product into a store; it’s showcasing and presenting it in a way that will maximize sales as well as customer convenience and satisfaction. Contact us today to see how we can help maximize the effectiveness of your product displays!